But let’s look at the following ways that the food and diet industry tries to convince us to spend our money. In this article we will focus on the subtle influences our society has on our food choices and dieting habits. The goal of the food companies, like any other business, is to increase the market (or the need) of the consumer. The holiday months from October to December are the biggest months to achieve that goal. However, the standby commercials still run after the new year for bite size chocolates, Coke, Pepsi, macaroni and cheese, chips and other celebratory foods for Valentines Day, sports events, Easter, and Passover. Consider some of the ways that food marketing is infiltrating our television programs like sports events, concerts, the award shows, American Idol, and others. The sponsors have turned our entertainment into subtle cues to encourage us to think about their products. If you watch Sunday morning news programs the marketing might be for Viagra, investing, and luxury cars. Watch daytime TV the advertisements are food, cleaning supplies, laxatives, and yogurt. I recently had on my television on Sunday morning after the news programs and it was 2 hours of infomercials for weight loss and getting into shape. I have everything I need in my home and life to workout but Christy Brinkley had me convinced I needed a home gym! 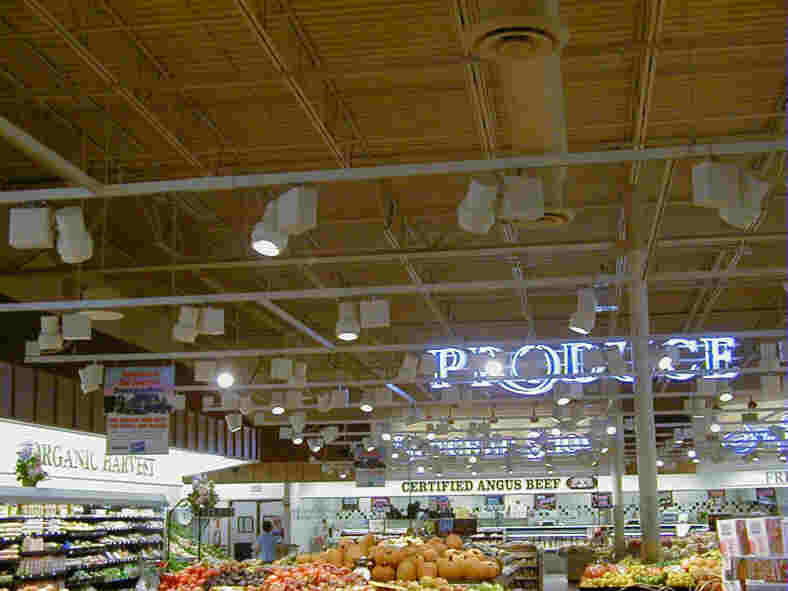 Supermarkets are staged for us to take notice of the lighting, music, and store displays. 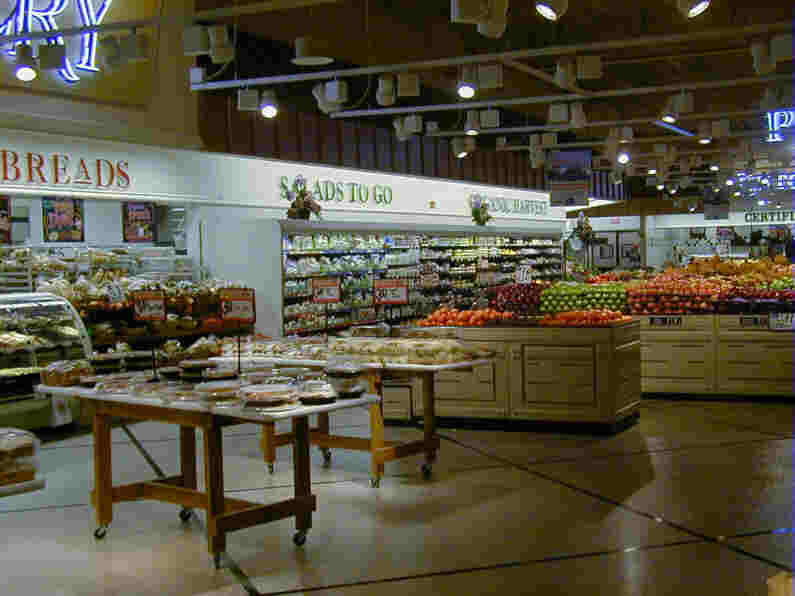 The goal of the supermarket is to keep us there as long as possible. 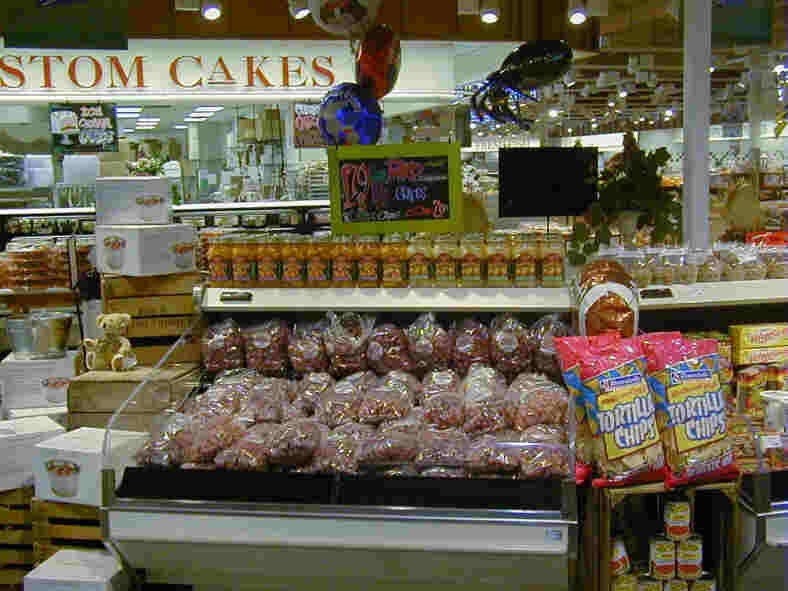 Market research estimates that approximately $1.89 is spent for every minute a consumer is in the store. Techniques such as the physical location of store items, displays, and slowing down the shopper with lighting and familiar music will entice the shopper to spend more. The most common staples in the American diet are bread and milk. Notice milk and bread are at opposite sides of the grocery store? By stocking those items farther apart the shopper is exposed to more impulse shopping and spends more. 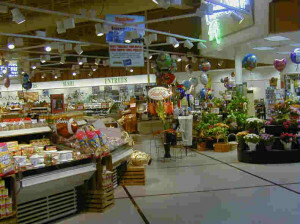 The entrance of the store invites you to the illusion of the outdoor market displaying fresh produce and flowers (Figure 1). 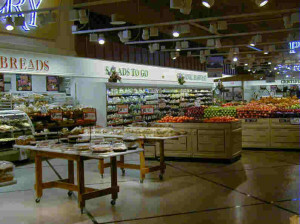 Some stores promote the feeling of the natural outdoors by misting the produce with the background sounds of rain and thunderstorms. The normal eye blinks 32 times in a minute. 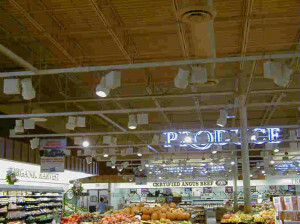 Store lighting is lowered to reduce the number of blinks per minute to 14, which produces a trance-like state. This trance-like state causes the shopper to slow down the shopping cart therefore increasing the time in the store and the amount of spent (Figure 2 and 3). The lighting is normal around the cash register so the customer will be alert when it is time to pay. Another method for slowing down the shopper is the music. Music slower than 60 beats per minute will cause the shopper to slow down the cart. 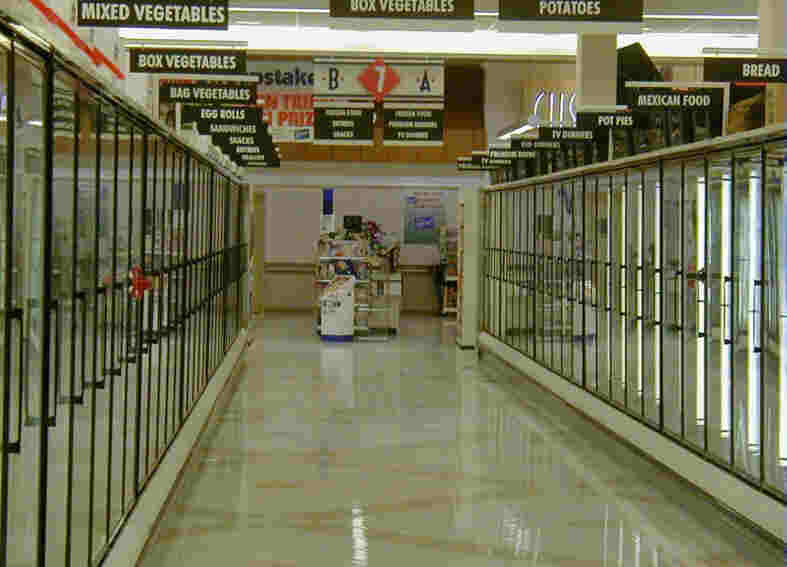 Another way to convince the shopper to spend more time on a shopping aisle is to increase the room or the width of the aisle. 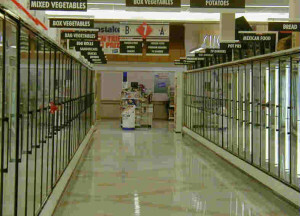 The wider aisles typically stock higher dollar items like frozen foods. 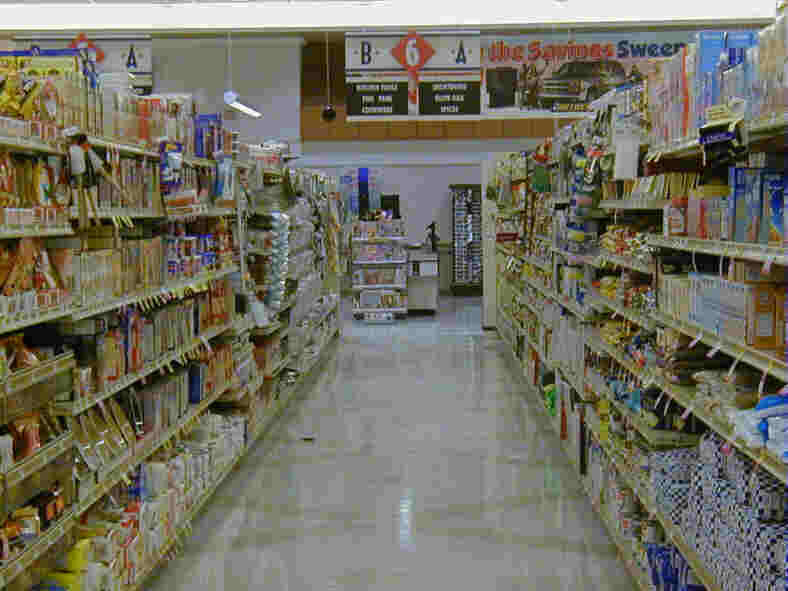 The wider aisles usually allow for 2 carts and a person to comfortably pass (Figure 4). 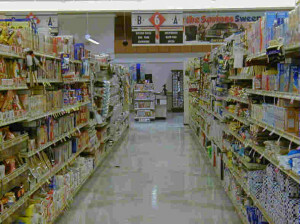 The more narrow aisles stock the cheaper staples such as sugar, flour, and salt (Figure 5). Store specials are most likely at the end of the aisle so the shopper will be more likely to put them into the shopping cart. These subtleties are so sophisticated that the majority of us never notice therefore continue to impulse shop. Once noticed however it is much easier to resist and therefore to stick to the list at hand. The same environmental cues are used in restaurants to encourage the patron to order more food and thus a higher bill. These cues may be enhanced throughout the holidays with holiday decorations, music, and the atmosphere of good cheer. Golden oldies make us happy and want to spend. The advertising campaigns by radio, TV, Internet, and printed media that begins mid-December conditioning Americans to diet beginning in January is huge. The popular diet products, aids, programs, and infomercials rev up the media attention anticipating the urgency of Americans to shed the pounds gained the during the previous months. Be aware of the promotion of these advertisements and the content of commercials. Most ads show dramatic results of the people in the ads with the disclaimer at the bottom of the screen that read, “Results not typical”. Celebrity endorsements, the television tabloids and new segments that report on trends in dieting suggest to us all that everyone is doing it. That further feeds the frenzy to get in shape by using this program, taking that product, or buying a piece of exercise equipment. Now there is the added marketing and emphasis on the marvels of cosmetic surgery to boost the hopes of us all to reclaim youth and sleek figures. It is not a bad thing to want to look better it just needs careful consideration, expectation, and study. And the first step to better health and beauty is lifestyle. The best plastic surgeons will tell you that. Notice the power of marketing of food and diets has on your own lifestyle habits. Identify the subtle hints on television shows, advertising, online placement and email advertising, in articles, recipe placement, celebrity endorsements, store displays that try to convince us to spend our money to eat the wrong foods then diet to lose weight. Maybe the awareness will cause us to maintain our weight saving money and calories.